It has come to the time of year when Masonic Lodges agree to donate grants to help local charities and good causes. St Botolphs Lodge of Freemasons at Sleaford has just presented cheques to two such organisations. The Lodge presented a cheque for £750 to Rainbow Flyers Youth Club to support young children in the community. The Rainbow Flyers Youth Club was set up in September 2015 by Karen Kenward at Ruskington Youth Centre for children and young people with autism and other special needs or disability​. It is dedicated to Karen’s son Thomas who has autism. It is a safe place for children with disability to interact, socialise and is an inspiration to us all. St Botolph’s Lodge has also presented Marjorie Atkinson with a cheque for £750 to support the excellent work she has done over the past 35 years in the communities of Great Hale and Heckington. 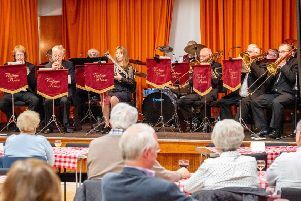 Marjorie provides the elderly and lonely people with social contact and comfort by holding regular meals at a luncheon club, whist drives and entertainment. Festive meals and entertainment are also arranged for those who would otherwise spend their time in isolation at Christmas. The Lodge says she tirelessly raises money for St Barnabas Hospice and helps to organise classic car events for the disabled.